The easiest way to house train a puppy (or an adult) is to use a crate. This is gentle and humane and dogs, being animals, like their crates because it is "home". The most important rule in the house training is consistency. Set up a schedule and stick with it for as long as it takes (and a week or two longer, just to be sure). The puppy is to be in his crate at all times unless he is (a) being fed or (b) being exercised. Only after he has "gone" can he be let out to play and then only for a brief period. Puppies like to eat and sleep so they really don't need to be out for long periods. They should always be crated at night and when you are to be away from home. This protects both the puppy and the furniture and carpets. 1. Puppies should be able to sleep all night in their crates without an accident by 3 months of age. He is to go outside immediately when he wakes up. Stay with him until he goes, praise him to the extreme and give him a small treat (piece of kibble, cheerio or bit of dog biscuit), then bring him back inside. 2. Use a high pitched voice for praise and a low pitch for scolding if you are present when the accident occurs. To scold him, pick him up and look him in the eye, then take him outside. 3. Feed the puppy when you bring him in and then take him back outside within 15-20 minutes of his meal. His crate is a good place for him to eat without the cat or the baby getting into his food. Continue to take him outside at least every two hours until you determine his schedule for relieving himself. This may involve all members of the household keeping a chart so that you can understand how often he needs to be outside. Obviously he must go out just before bedtime. 4. Anytime during the day when you cannot give the puppy your full attention, he should be in his crate. This means when you are on the phone, cooking, cleaning, dressing, playing, eating, sleeping, etc. If you are successful, you must be about to watch him when he is not crated. If you must leave the puppy longer and do not want to crate him, use a small confined area free of dangerous electrical cords or anything that can be chewed. Provide his crate with the door open for easy access. 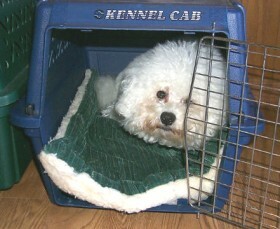 However, crating is the better method for housetraining and should be done as much as possible. What about paper training? This is a decision you must make early on. If it is a male, he probably should never be paper trained. Females can learn to go outside as well as on papers and this can be useful in parts of the country with bad winters. The papers must - from the start - only be placed in an area where they will continue to be permissible, usually a laundry room. The earlier a male is neutered, the less likely he is to lift his leg, so do this around 6 months of age. Portable exercise pens can be purchased for dog supply vendors and are useful if you do not have a fenced yard. This is both a safety feature and a sanitary one. If your Bichon is a jumper or a digger, do not leave him unattended in either a yard or a fence. Electric fences are not good for Bichons, in part because it offers them no protection from other dogs, dog nappers or other unsafe conditions.